By Ryan Whitwam on April 29, 2014 at 11:33 p.m. The Galaxy S5 comes from a galaxy far, far away from the Galaxy S4. What can an OEM do to stay on top after it has become the clear leader in an ecosystem? That was the question facing Samsung after the massive success the first four Galaxy S devices. Despite the use of gimmicky software features, Samsung solidified its dominance of Android handset marketplace with the Galaxy S4. The Galaxy S5, perhaps because of that solid lead and mindshare momentum, doesn't shake things up too much. This phone looks and feels like a Samsung smartphone--it's plastic as far as the eye can see, but the company has still learned from its mistakes. I put my Nexus 5 away and have been living with the Galaxy S5 for a few weeks now. Let's dig in and see what it's like to live with Samsung's newest flagship phone. 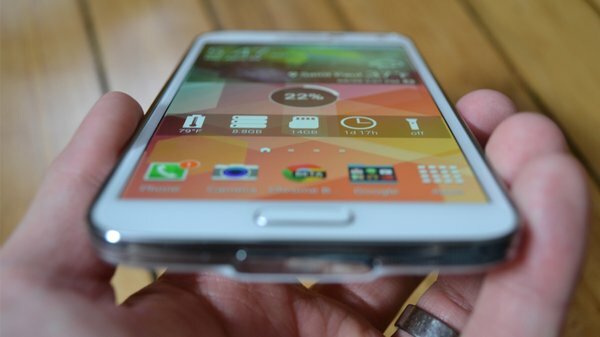 Even from a substantial distance, you could probably identify the Galaxy S5 as a Samsung phone. It's rectangular, plastic, and has a physical home button at the bottom (with fingerprint reader, which I'll get to later). You could be forgiven for failing to notice the subtle differences from the Galaxy S4, but this device is actually a bit closer in design to the Note 3. The corners are slightly more boxy this time, and the edge has the same ripply embellished pattern seen on the Note 3. The design of the back is contentious to say the least. Comparisons have been made to a band-aid, and that's not unfair. The dimple pattern is not quite as bad in person, though. Despite the pattern being a little odd, I will say this back is an overall improvement from the Galaxy S4. Why? It's actually a bit grippy and doesn't get greasy and covered with fingerprints in five seconds. It still lacks the super-premium feel of the HTC One M8, but it's nicer to hold than the GS4. The back cover is still removable, which presents an interesting conundrum for Samsung. The Galaxy S5 is water and dust resistant (IP67 certified). That means it can theoretically survive up to 30 minutes in three feet of water--more than enough to withstand a quick accidental dip in the toilet or bathroom sink. The back has to be completely sealed all the way around, and it's actually more tricky than you'd expect. There are a dozen little plastic clips that need to be hooked into the frame. It might not be visibly apparent if one is not snapped in, but that's enough to render the device vulnerable to liquid. You really have to be careful attaching it. There is also a port cover on the bottom that I'm not fond of at all. It's so flimsy that I'm sure it could easily snap off, thus rendering the phone no longer water resistant. Past Samsung phones have always felt flimsy to me, but I have to hand it to the company this time -- the GS5 is a real improvement. 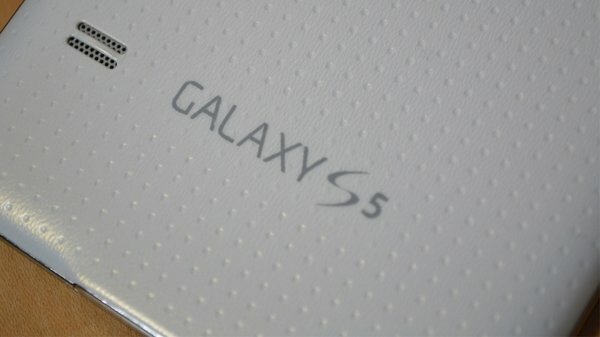 Right from the start the Galaxy S4 could be kind of creaky and weird, but the GS5 seems much more solid. This probably has something to do with the IP67 rating. The phone actually has a midframe that most of the internals are mounted to, making the device more rigid (also a bit less repairable). Lurking within the Samsung Galaxy S5 is some of the most impressive hardware you'll find in an Android device. The Qualcomm Snapdragon 801 is joined by 2GB of RAM, 16/32GB of storage, and a removable 2800mAh battery. Around back is a heart rate sensor that does what it's supposed to, though I don't know why anyone would want to use it. 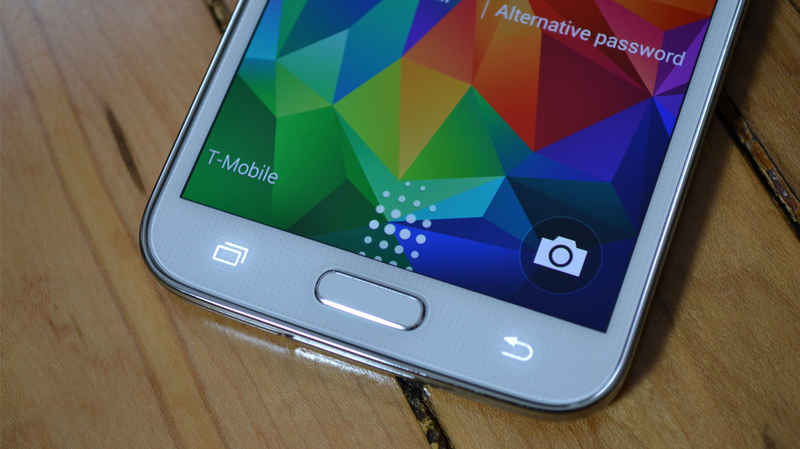 There's nothing wrong with the Galaxy S5's design, but it's not a beautiful phone. It's a modest improvement over the Galaxy S4, and skips the faux-leather look of the Note 3 back. It's nice to see Samsung go with a more solid IP67 rated design too. You just have to appreciate it for what it is rather than what you wish it was. Let's take a closer look at that screen--Samsung's AMOLED panels haven't impressed me much in the age of great 1080p LCDs, but this screen might turn it around. 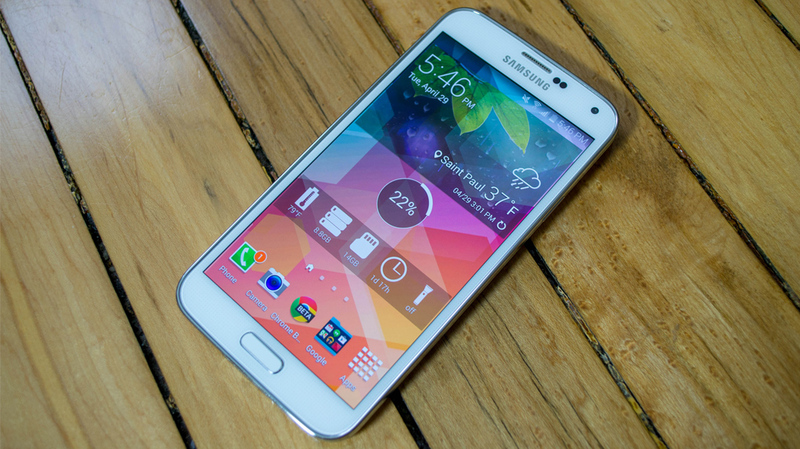 The GS5 has a 5.1-inch 1080p Super AMOLED panel, so at least on paper, it's not a big update. There were rumors of a 1440p screen coming in this generation, but Samsung instead focused on other aspects of the screen. The 432 pixel per inch density is more than sufficient for crisp images even with PenTile subpixel arrangement. Viewing angles are also right up there with the other top-of-the-line phones. Touch response is tuned appropriately, and you can enable a high-sensitivity mode that makes the GS5 usable with gloves. AMOLED has always been worse in outdoor light than LCD because all the light comes from the pixels themselves, as opposed to a backlight. This lower average brightness makes them wash out easily, but Samsung has cranked the brightness way up to almost 700 nits at the high end (according to DisplayMate). On the other side, the GS5 can go down to an incredible 2 nits for use in a dark room. The mottled pattern of past AMOLEDs (called mura) has also been done away with at low brightness levels. There is a slight purplish ghosting effect at minimum brightness (i.e. auto mode off and the slider all the way down), but it's still excellent for low light usability. Colors are a little skewed on almost all AMOLEDs, but again, Samsung has done a good job making that less of an issue on the GS5. 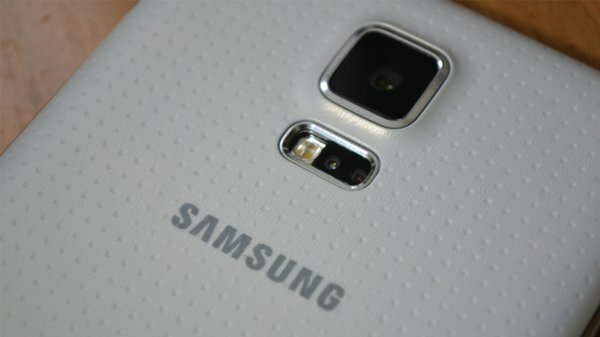 The whites are actually pretty much white on the GS5, rather than a grimy off-white that lesser AMOLEDs can have. Blacks are, of course, still completely pitch black and awesome. The colors displayed on the Galaxy S5 are a bit saturated for my tastes, but the cinematic or professional photo color setting looks much closer to "real" than the GS4 did. Battery life is a hard thing to gauge on a smartphone -- everyone has different app selections, usage patterns, and requirements. I will say that, on average, the Galaxy S5 has very good battery performance. No new device is without its foibles, though. I'm seeing occasional issues with wakelocks that prevent the device from sleeping properly, but that's probably not going to come up for everyone. 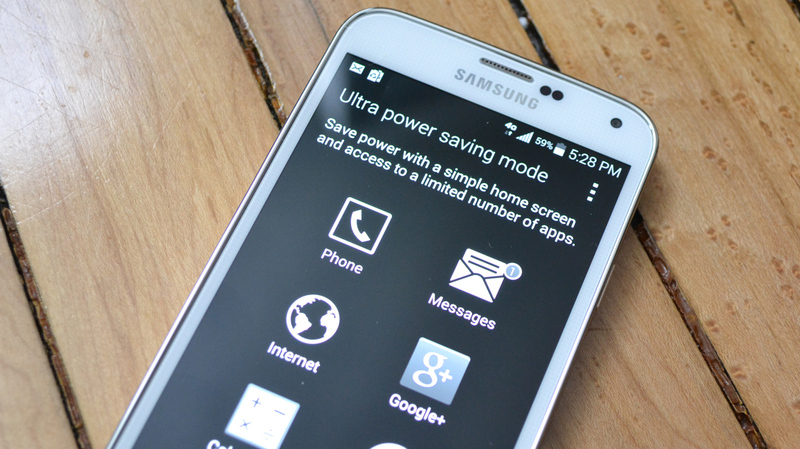 The Galaxy S5 is capable of well over a day of life without a recharge--and that's moderate use. if you use it only lightly, I see no reason you can't make it two whole days. 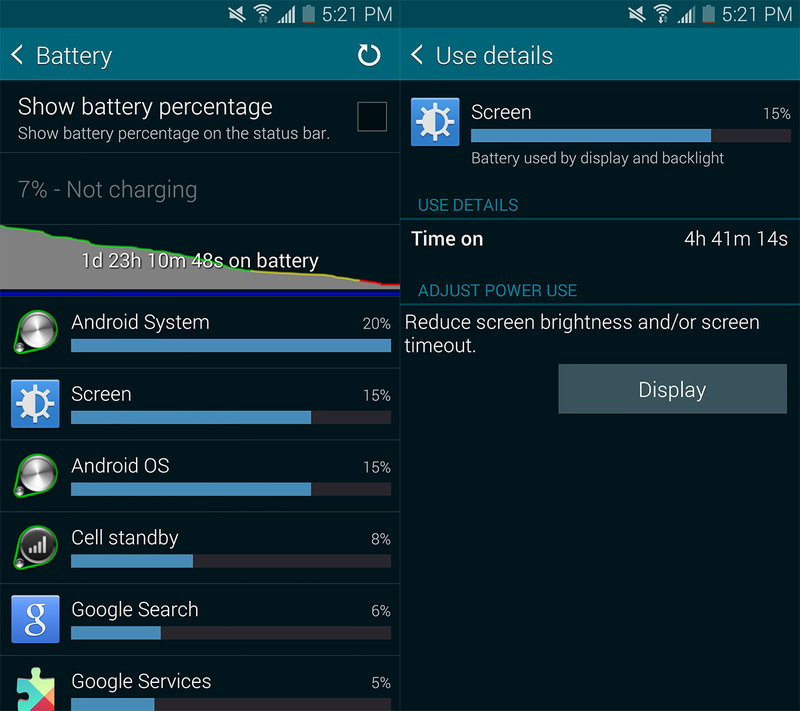 A better measure of Android battery life is the screen-on time. With this phone, I'm getting about five hours with moderate use over two days, and sometimes closer to six with less standby. Keep in mind, those automated battery rundown tests you see posted all around don't take into account the power used by the digitizer--you're not going to see 10 hours of web browsing on the GS5, but it's still above average. Of course, one big advantage here is that the battery is removable, so you can carry a spare for times when you know you'll be away from a charger. 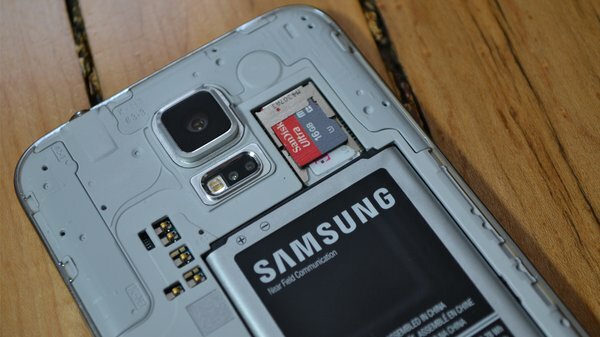 Annoyingly, Samsung has again neglected to build wireless charging into the GS5. Instead, a wireless charging back will be released in about a month that adds that feature for $30. Samsung is going for the traditional megapixel approach to improving its camera. The HTC One M8 is sticking with the 4MP Ultrapixel camera, so Samsung's flagship now takes images with four times the pixels of HTC's. 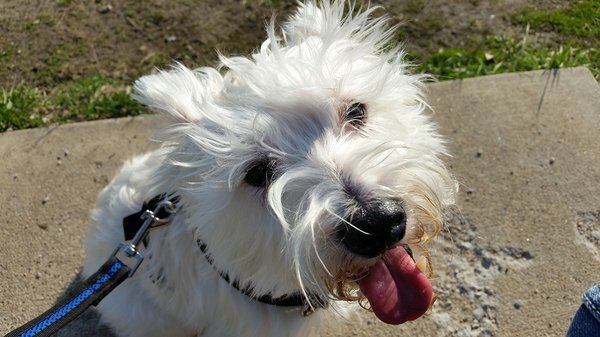 You'd be hard pressed to find an Android device that takes better outdoor images than the Galaxy S5, and it's no surprise with all those pixels. Most pictures come out looking amazing with tons of detail and accurate colors (when viewed on an LCD screen). Samsung also beefed up its focusing technology this time for much faster and more accurate target detection. 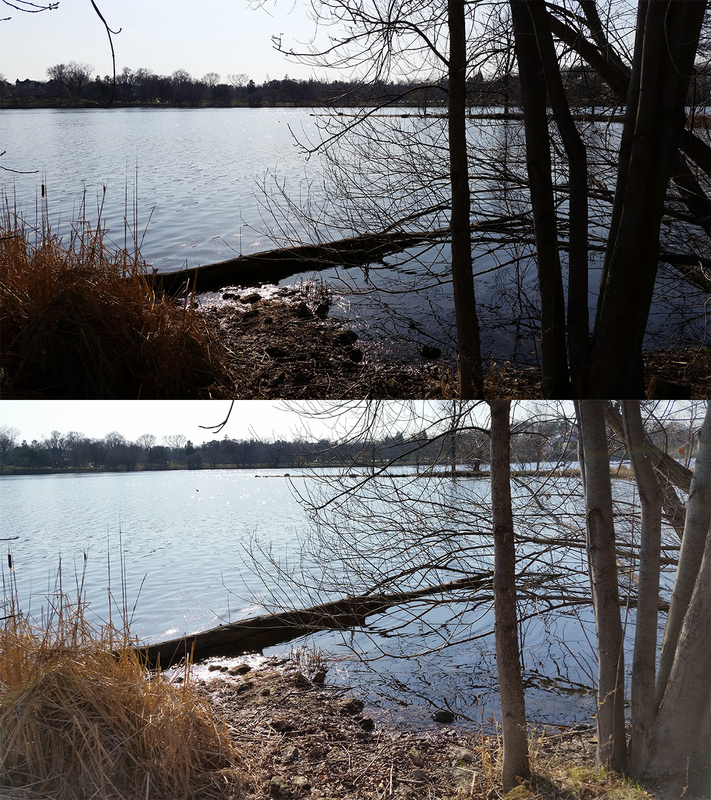 The live HDR preview is another feature you'll really notice -- it works amazingly well. As for the actual HDR images, they can be captured in about the same time as a regular shot, and they look better than the HDRs I've seen from any other Android device. 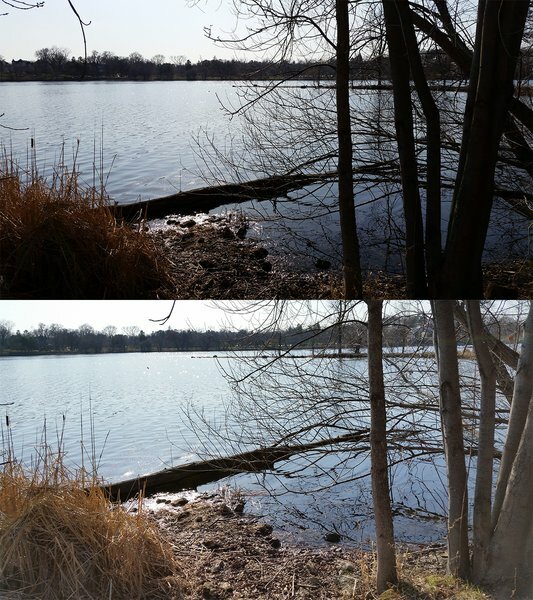 The camera app has been massively cleaned up in the Galaxy S5. There are only a few buttons in the main viewfinder, and you can choose which ones are there from the expanded settings list. Some of the bizarre extra features that Samsung introduced in the GS4 have been pushed off into the Shots and More mode, and still others are just add-ons available in the Samsung app store. It doesn't offer the kind of full manual control HTC's new camera does, but most of the pictures look great with auto settings. The one exception is dim light--the Galaxy S5 struggles noticeably there. I'd actually say the shots are more noisy and dark than similar ones taken with the Galaxy S4. It's probably a software tuning issue, but The HTC One M8 is clearly better in this limited use case. If the light's shining, it's GS5 all the way, though. 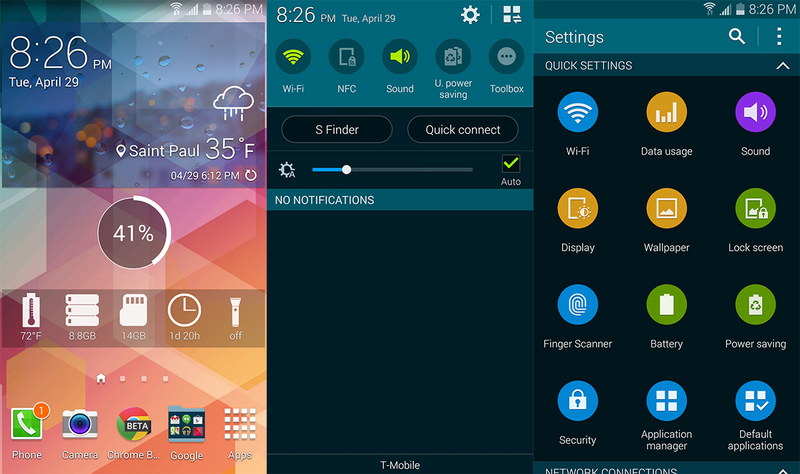 I haven't been a fan of Samsung's TouchWiz interface over the years. It went from horrendous on the original Galaxy S to tolerable on the Galaxy S4. With the Galaxy S5, Samsung is displaying a new level of restraint and attention to detail in it's Android modifications. 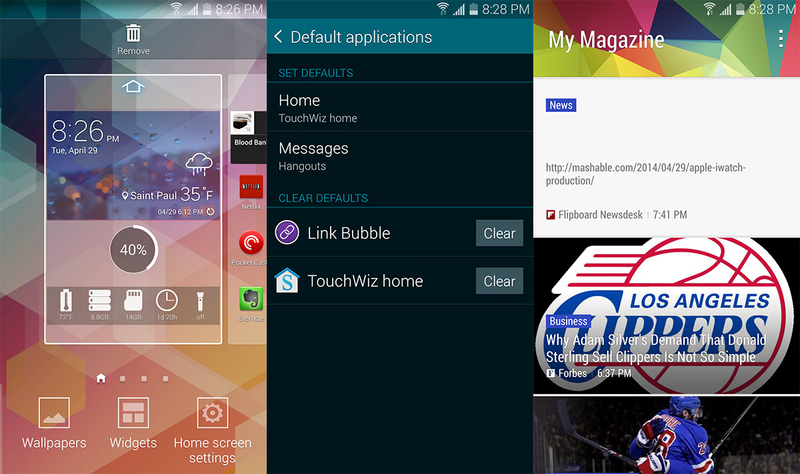 TouchWiz looks better, runs faster, and generally gets out of your way to a great extent. The home screen is responsive and mostly free of unnecessary junk. Samsung has opted to build Google Now voice search into its home screen, much like the Google Now Launcher. Google Now itself is no longer hidden in the multitasking interface. You can call it up with a long-press of the home button. Moving from screen to screen is fast and lag free, even with a ton of widgets -- except for one thing. Samsung has included a new Flipboard "My Magazine" panel on the far left of the home screens. It's a bit like BlinkFeed on the HTC One, but terrible and slow. Luckily, this can be disabled in the home screen settings. Moving into the notification panel, Samsung has again cleansed itself of some annoying old habits. The GS5 no longer produces a notification for every conceivable activity on the phone -- no more persistent WiFi item, and no more strange notification when charging the device. There is a new line with links to S Finder and Quick Connect, and no, you can't remove them. At the top of the notifications are the restyled settings toggles. This is our first glimpse of Samsung's new theme. It uses a lot of muted blues and a splash of green accents. It is, surprisingly, not bad. There are also a lot of circles to be found, which leads me to the settings. Samsung's new layout is an array of circular buttons, which is a bit daunting. There is less digging down into sub-menus than with stock Android, but that means more entries in the main list. Adding a fingerprint to the GS5 allows you to unlock the phone with a swipe, verify your Samsung account, secure private files, and even log into PayPal. This implementation is no where near as easy at the iPhone 5s, but it's usable. The key is to tilt your finger to the side a few times while enrolling so the system learns the pattern from multiple angles. I'd like to see this feature used in more ways, but I fear it's just awkward enough that it won't catch on. The underlying version of Android on the Galaxy S5 is 4.4.2, which is the most recent build at this time. That's great, but you can expect delays as usual once the next version of the platform is out. Most of the features you'd expect are there, including HCE for Google Wallet support. For whatever reason, Samsung removed lock screen widgets, which I think is incredibly lame. Looking at the overall feature set Samsung has gone with for the GS5, it's clear how much effort was put into making it a more streamlined experience. A number of the "Smart" features introduced in the Galaxy S4 are completely gone, and several others have been buried deep down in the settings. This is actually a great move -- sometimes less is more when it comes to Android ROMs. I also have to applaud Samsung for the laser-like focus on a few very nice features that are debuting on the Galaxy S5. Ultra Power Saving Mode can stretch 10% battery life into more than a day of standby time by disabling CPU cores, turning off background data, and changing to a simplified black and white interface to save screen juice. It's a very effective and useful feature that sets the GS5 apart from the competition. One of my other favorite things about the Galaxy S5 is something you might not be able to try out. 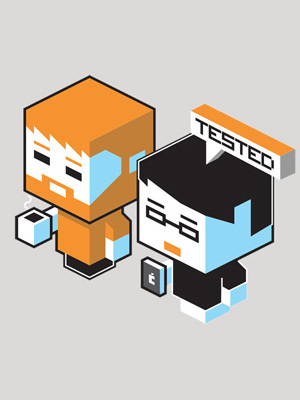 Download Booster is able to tie together your WiFi and LTE radios to team up on a single file download (over 30MB). The result is considerably more speed. I was totally prepared for this feature to fall flat, but it works -- really well. 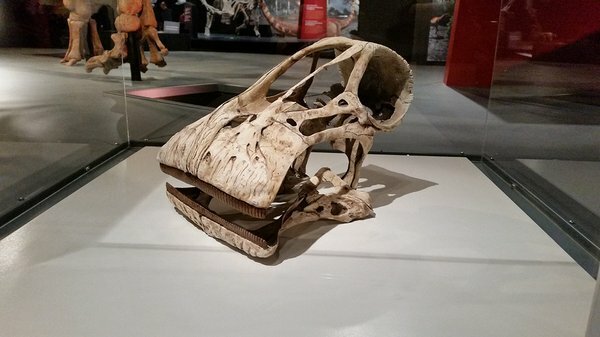 Sadly, T-Mobile is the only national US carrier that allowed it to be included in the ROM. AT&T, Sprint, and Verizon all had it disabled to prevent people from using more data. With the incredibly powerful Snapdragon 801 inside, it should be no surprise that the Galaxy S5 is a fast phone, but it's actually about the same speed as the Nexus 5 with its much cleaner software build. That's an impressive achievement for Samsung. But is It Better than Nexus? While Samsung's devices might not be as compelling to me overall as a Nexus (or almost Nexus) experience, the Galaxy S5 is the most impressive phone Samsung has ever made. The overall look and feel is more mature and most of the ridiculous features are gone or hidden from view like a secret shame Samsung cannot confront. At the same time, the addition of features like Ultra Power Saving Mode and Download Booster make the case that Samsung is finally focusing on usability in TouchWiz. It's more sturdy than its predecessor, though still clearly a plastic Samsung handset. The screen is excellent, as is the camera under most conditions. If Samsung can tweak the software for better low-light performance, it would be nearly perfect for mobile picture taking. Then there's the battery life, which can be a little inconsistent, but manages to be overall excellent.